Own a Samsung Galaxy S3 free from Sun postpaid Elite Plan 1500, you can have this 4.8 inch super AMOLED touchscreen Android phone with 8 megapixel camera and a 1.4 GHz quad core processor for only 1500 pesos a month. Galaxy S3 was offered before on Sun Plan 1699, now it gets lower and better as is includes new level of unlimited services. This is another good choice from Sun Cellular on their Postpaid Plan. 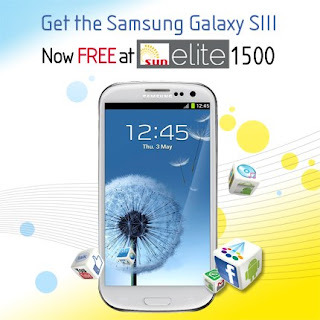 Continue reading more details about Sun Elite Plan 1500 below. Manual GPRS, MMS, 3G Network Internet Settings on Your Android Mobile Phone and another tips also on How To: Connect to Wifi Using Your Android Phone Steps. To apply Sun Cellular Postpaid plan, you can call 395-800 or visit your nearest Sun Shop to inquire before availing this postpaid plan. For list requirements on applying Sun Postpaid plan you may see here. Just comply to their terms and conditions and complete the applications requirements. For more information, visit Sun Cellular Facebook page www.facebook.com/suncellularph. Follow @suncelldeals on Twitter. why smart and globe are cheaper regarding to this Plan of samsung s3? can i ask....magkano ang cash out?